The Lebanese fencing federation, has officially honored Lebanese wheel chair fencer Elias Semaan, in a ceremony organized at the federation headquarters in Dekwane, with the presence of the federation’s president and members. 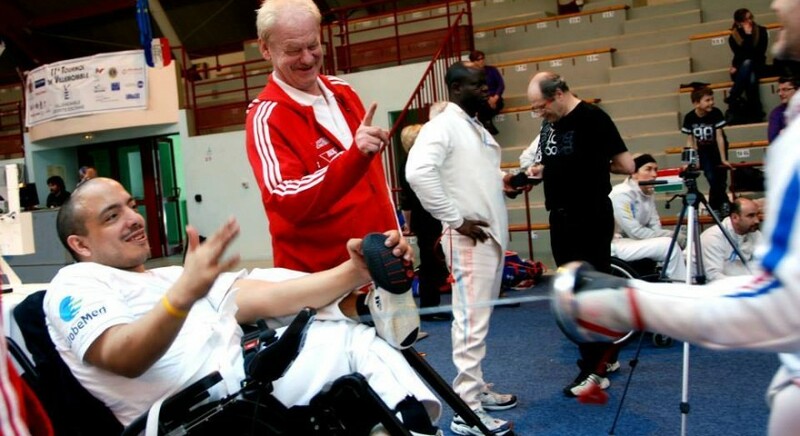 30 year old Semaan, is the Lebanese wheel chair fencing champion, precisely with the foil and sabre weapons, and is among the top 20 fencers in the world according to official world rankings. Elias, has left Lebanon 10 years ago heading to France, to pursue a professional fencing career there with Lebanese coach Jihad Tanios. Nevertheless, he gets back to his country at the end of every season. During the ceremony, the president and rest of the members thanked Elias for raising Lebanon’s name worldwide and congratulated him on his success. Also, the federation asked the people in charge from the government to help this sport, and help the disabled athletes even more. On the other hand, Semaan also thanked the federation for the ceremony, and offered his services to help other wheel chair fencers that are striving for success. At the end, the Lebanese champion was given a souvenir by the secretary general of the federation.